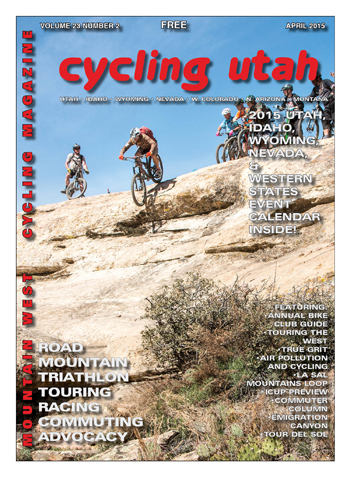 Cycling Utah’s April 2015 Issue is Now Available! Cycling Utah Magazine's April 2015 Issue is now available as a free download (9 mb download), Pick up a copy at your favorite Utah, Idaho, Wyoming, Nevada, Montana, W. Colorado, N. Arizona bike shop or other location! Cover Photo: Over the Edge, Hurricane owner Quentin Morisette, dropping in on Little Creek Mesa during the 5th Annual Hurricane Fat Tire Festival in late March. Photo credit: Photo-John, a.k.a., John Shafer, is a professional photographer and journalist in Salt lake City. Visit Photo-John.net for more adventure photography, articles and camera buying guides.